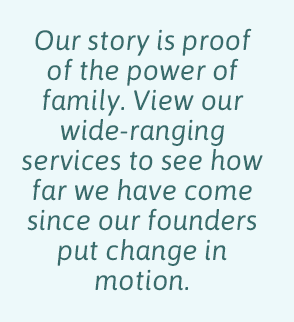 We come from dedicated families who wanted to change the path for their children living with an intellectual disability. 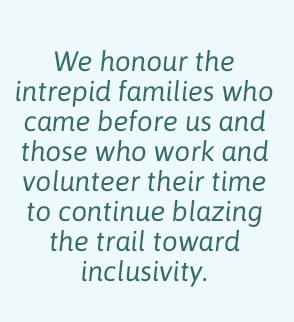 With deep respect, we continue to walk the path of the brave trailblazers who formed our original Association, tackling systems as needed to help build an inclusive community for all. Two moms bring together a group of 11 parents and concerned citizens. At the kitchen table, they decide to become a recognized part of the society of their time. They are known as the Association. Regular schools will not allow children with disabilities to attend. In response, the Association decides to form a school. They begin by creating a class for children with disabilities in the lower hall of the Royal Canadian Legion. 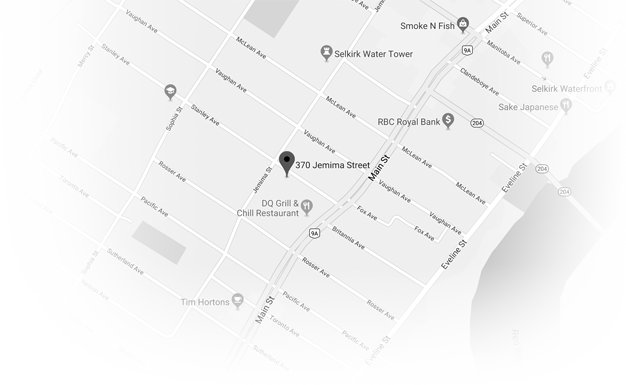 The Royal Canadian Legion builds a school for the children at 306 Jemima Street. Volunteers and the Town of Selkirk pitch in to help. After strong advocacy efforts by many groups, the Department of Education assumes responsibility for the education of children with disabilities. It opens a special education unit at Daerwood School. At this time, the Royal Canadian Legion School becomes an activity centre for adults living with an intellectual disability. Over the years, it becomes the pre-vocational training centre, ARC Industries. The Association has an overriding desire to bring people living in institutions back to their home communities; to support people who are able to return to their family homes and to establish housing for those who cannot. Our first residence opens in Selkirk. The Provincial Welcome Home project helps communities bring people home from the Manitoba Developmental Centre. The Association opens a second residence to accommodate them. The Association builds two homes to support community members living with an intellectual disability. The Association decided to operate under the name Community Living Selkirk. CLS purchases a 3-bedroom bungalow and renovates the basement to create a single bedroom apartment. It is the first step in our quest to provide affordable apartments for people wanting independence in their own home. CLS purchases a second 3-bedroom bungalow and renovates the basement to provide a single bedroom apartment with a separate entrance to ensure privacy between the main floor and basement tenants. The reno creates more space for recreation activities, in house contracts, and administrative staff. With the addition of an elevator, our basement space becomes accessible for community and program use. We purchase and renovate the home to include an accessible shower and an independent living suite in the basement. We design and build our first fully accessible home for people of all abilities. The home is equipped with a fully accessible main floor, an accessible washroom, wide hallways and doorframes, an open concept living area, and three self-contained basement suites. We purchase the 3-bedroom bungalow to accommodate two young ladies transitioning into agency supports in their own home in the community. We purchase our sixth home, a 3-bedroom bungalow, and add a 2-bedroom suite in the basement. We purchase another 3-bedroom bungalow and create a single bedroom apartment in the basement with full kitchen, living room and dining area. We open the home to provide individuals and families with accessible respite. The home includes two basement apartments and an accessible self-contained suite on the main floor. Our Skills division finds its current home at 377 Eveline Street and opens our Social Enterprises endeavours: The Riverside Grill and Community Threads. ARC adds an accessible personal care washroom, additional recreation space, and small rooms for individual activities. We are now building our newest home, which will include two supported independent living suites, as well as a separate suite on the main floor for families who are visiting their relative from out of town and require space to stay or spend time together, away from the shared group home living areas. We become Inclusion Selkirk as Community Livings across Canada decide to change their name to Inclusion. This website helps us launch our new name and logo.